Pauline Meyer’s winning photograph is a whole plant picture of Western Australia’s flamboyant Queen of Sheba Orchid. 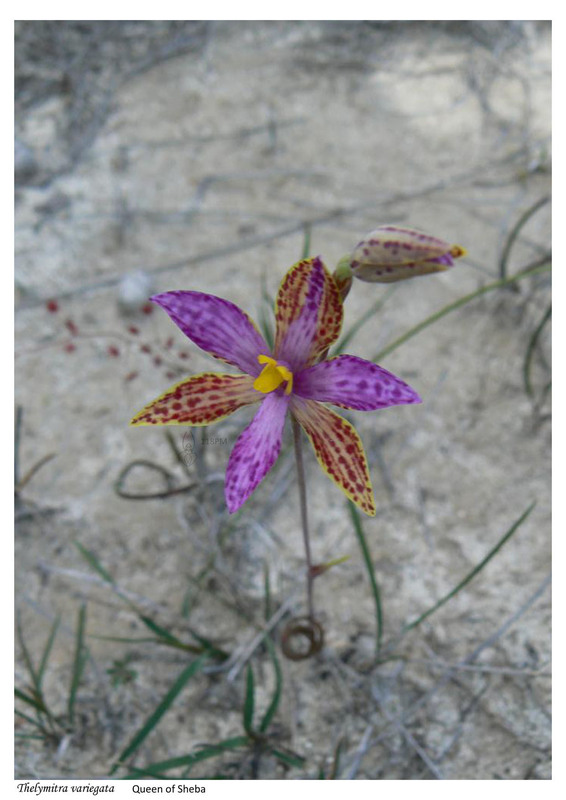 It was taken at Eneabba, north of Perth and identified by a local as Thelymitra variegata but in consulting the books it would appear that it is the Northern Queen of Sheba, T. pulcherrima. There are three species known as Queen of Sheba orchids in Western Australia – T. varigata, T. pulcherrima and T. speciosa. T. variegata was originally named in 1839 by John Lindley but under the genus Macdonaldia. In 1865 Ferdinand Mueller moved it to Thelymitra, later people began to separate it out to three different species* but it wasn’t until 2009 that Jeff Jeanes describeds T. pulcherrima and T. speciosa as distinct species from T. variegata. All three species have a single thin spiral leaf and showy multi-coloured flowers. T. pulcherrima and T. speciosa differ from T. variegata in the following points. T. speciosa, begins flowering earlier, is a slightly shorter plant with fewer flowers (one, more rarely two) and although the flowers are a similar size to T. variegata they are even more colourful and the petals and sepals are distinctly different colours. T pucherrima is similar in height to T. variegata but has smaller flowers with yellow, red, purple mauve sepals and pink purple mauve petals. It too begins flowering earlier than T. variegata. Finally there is one other species that is similar to these three and it is called Cleopatra’s Needle, T. apiculata. I would like to thank Andrew Brown, co-author, for his help with this article. This entry was posted in Monthly photo competition, Orchid Identification and tagged Australian orchids, Orchid Identification, orchids, Photographing orchids, photography, Queen of Sheba, Queen of Sheba Orchid, Sun Orchid, Thelymitra, WANOSCG, Western Australian Native Orchid Study and Conservaton Group, Wild orchids. Bookmark the permalink.